Be one step ahead in your marketing decisions using WakeupData's Scrape and Crawling services. Got no feed? Not a problem. We can crawl it for you! You can download the whole data in Excel format or use Expand for creating exports in other versions such as .XML, .CSV or .TSV. Grab tags, styles scripts - you name it! Tags, classes, styles, scripts, meta data, descriptions, images... go after anything. We deliver our solutions in the form of highly optimized products. You can specify exactly which competitors and suppliers you want to monitor, what you want to include and exclude and which channels you want to export to. The Business Suite offers products and services built for the marketing professional. You can accurately and efficiently monitor your competitors, match products and stay ahead with new market trends. You can use our crawler to grab any information you need, specifying the path you wish to take and the sites you wish to crawl - you have the control. Recon allows you to see the real picture and make informed decisions based on your needs: stock information, product specifications and sales trends. What does the Recon service involve? Recon is a product that allows you to scout out your competition and gain valuable information by having us gather information on their website and giving you up-to-date statistics on how well you compare to your competition. What does the Crawl service involve? 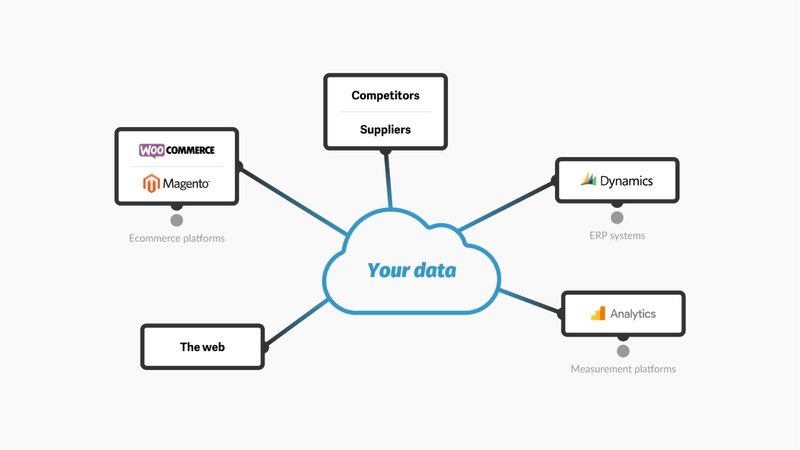 WakeupData Crawl is an on-demand service, which allows you to go through a desired website, find and extract information you like while creating new data based on product variants or other available details. Do clients provide the URL of each product on the websites of their competitors? Yes, the competitor monitoring services are based on URLs, but we usually perform batch runs, where you don't necessarily need to provide every single product URL. In most cases a competitor name and main website or domain is sufficient; we can then deliver comprehensive reports on pricing and product lines. What data do WakeupData need to ensure that a competitor's product is the same as a client's and what is our matching rate? We have a good handful of different parameters giving the basis for our (semi)automated product matching. We produce a net list of potential candidates, where you click on the best match if no 100% matches have been found. In most cases we match about 1500-2000 products per hour this way. Why is price tracking important? Price tracking is vital in order for you and your business to become visible and stand out from your competitors. What is the difference between crawl and scrape? Crawling is essentially what companies such as Google, Yahoo, MSN and others do, gathering any kinds of information regardless of what they are looking for. Scraping is generally more targeted at certain websites, looking for specific information, e.g. for price comparison, so that the methodology and software are different. Can I use the platform myself? Yes, we've created an easy-to-use system for you to be able to manage your data feeds yourself with grace, elegance and the ability to make the changes you want whenever you need. When tracking prices, do WakeupData search for the data directly from client's sites or does the client provide this data? We can do both. If you have your product in a feed, that will typically be the best way to go. If you have no existing feed, we simply gather the information needed directly from your website. after some time, the competitor does include it in its offer? If this happens the Competitor Monitoring report will automatically notify you of additions to the competitor's product lines. On an ongoing basis those newly found products are added to the (semi)automated matching process. Sign up to get started, import your products and sell more!